I’m somehow 4 days deep into the new addition to the Five Nights at Freddy’s franchise, a series of games that I myself have reviewed in the past. I love these games! The game-play mechanics, the presentation and the mysterious lore that have fans stumbling over YouTube videos and websites dedicated to the theories behind what truly happened at each location. I can’t help but wonder though with every release of a new FNAF are we getting any closer to the final crescendo? Or will the tail of the bite of 87′ and the downfall of everyone’s favourite restaurant be dragged out like the waiting time between the releases of every season of The Walking Dead!? Seriously how long is it till October!? No longer are we shackled to a chair in a security room in the role of night watchmen in this part of the infamous story. Instead we see the story unfold through the eyes of a child, awake at night, at the foot of your bed, with nothing but two long hallways through the doors at each side of a room in an oddly placed bedroom and the closet. But which child? In terms of set up from the off, this feels scary and not only that, closer to home. We all grew up knowing there might be monster in the closet. Imagine knowing that it was Foxy in there! The new chapter in the story is played quite differently to it’s predecessors in that we no longer have any visual aid or anything to keep on top of the cuddly fright machines. Instead, we are now reliant on completely immersing ourselves into the game by donning our headphones and listing out for the slightest hint of breathing or footsteps! 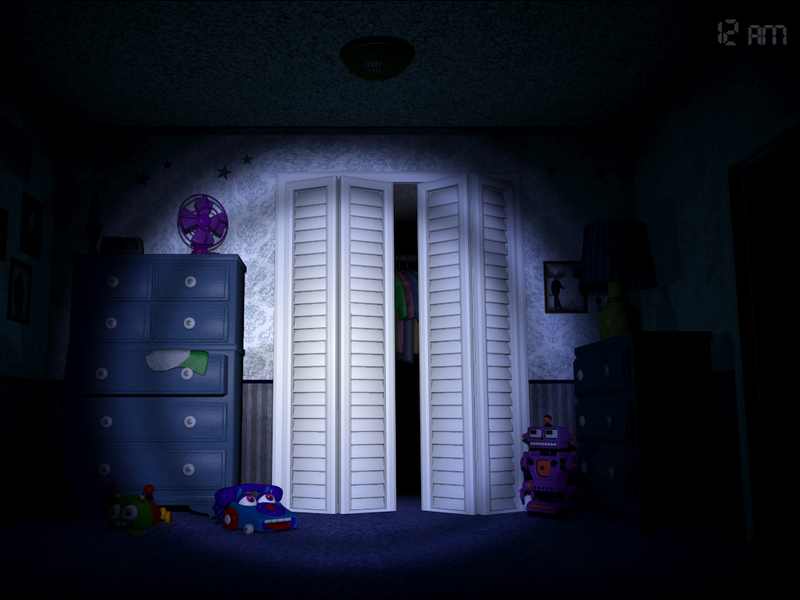 Oh, and the little screams of these mini Freddy dolls that appear on the bed behind you. Yes, behind you, definitely don’t forget to look behind you! The only problem with using audio instead of camera’s, one of the main mechanics in FNAF 1, 2, and 3, is that it can sometimes be a little unclear and, at first, a little confusing. You MUST use headphones in this to get the best experience or expect a visit for Chica every 3 minutes as it is very difficult without. Another nice touch, other than feeling like you’re actually in the child’s bedroom, is how you proceed to check the doors and peer down the really really dark hallways with your torch. When you select what side of the room you want to check, you crawl towards it. Face down! It doesn’t seem like much but it feels like it takes ages and you think someone’s going to be there as soon as you look up. 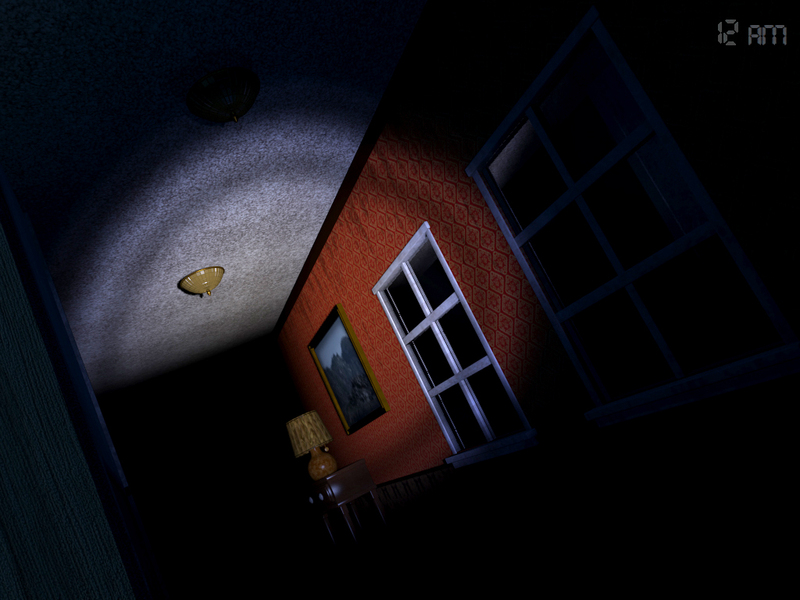 Once you reach the door your head pops up to peer out into a pitch black space. It’s here where things get worse. This is where we have to listen very carefully. You can shine you torch down the hall if you think whoever is there is far enough away, but if you hear breathing close by SHUT THE DOOR!! Don’t switch the light on, just shut it! The fact that our furry friends appear from shear darkness just makes the jump scares even less expected. Add to that fact, we are wearing headphones makes the sound more intense and as I was going for my cup of tea, it meant some of it ended up on my leg. That’s probably the most British description you can get my experience of a jump scare! As I said before I’m only on the fourth day this time round and I needed to take a break from playing the actual game as 1. the jump scares, but 2. because, although the change from cameras to sound is a nice unique twist on the game and it definitely works on making a tense, deep atmosphere, I kind of want to know the whole story already. Sometimes after loosing my temper at dying a little too much, I turn to YouTube and watch other gamers’ play it instead of letting the story unfold natural on my own. It’s also more fun to see other people jump rather than me. I think this is both the pro and con of having a game franchise like this. The story is great, but is being told rather slowly. It makes me wonder if that’s bad thing or if Scott Cawthon is trying to give the franchise more suspense and mystery. Like Minion memes on every 40 year old and ups Facebook pages, it spreads like wildfire on YouTube making me want to watch more than I want to play. If you want free advertising for a game then sure, this is perfect! Surely people will get this game and give it a go, but I can’t help but feel it’s sometimes better to see Markiplier jump out of his skin and wait for another Game Theory episode on the subject than do it myself. In some peoples eyes, this could be seen as a problem in terms of sales of the game, a case of window shopping if you will. For fans of the theory behind this franchise, you’ll be happy to know there IS something worth playing for right at the end!’. There will apparently be DLC for this game coming in October, just in time for Halloween! So not only will The Walking Dead start again, we’ll also get something new for this game in that month! October’s going to be pretty good! If you play the game yourself or enjoy the ‘Schadenfreude‘ of other players, I will always recommend you get the games to uncover the story behind Freddy Fazabear’s Restaurant. It’s one still shrouded in mystery and will always have people talking about it all over the internet. Not a gamer? Check out the videos, look up the lore! The way the story is told and peoples view and opinion of the franchise is great to see. 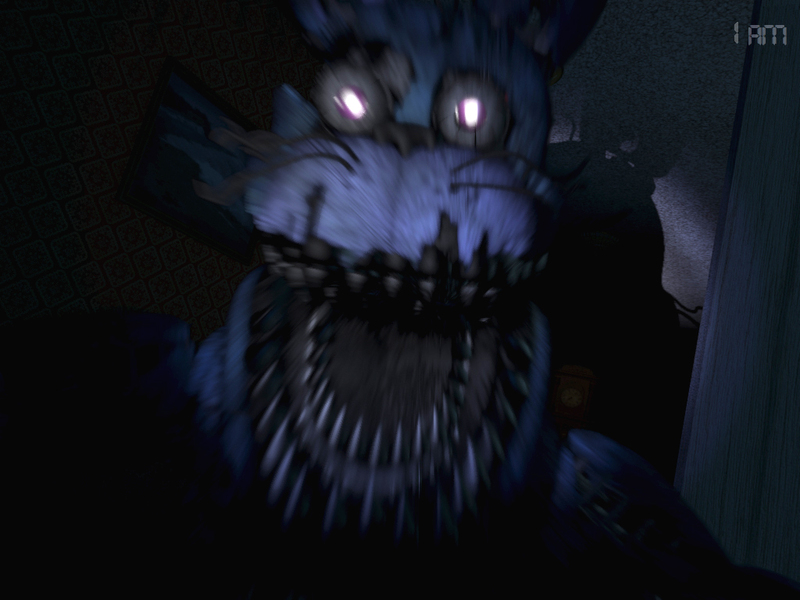 This entry was posted in Uncategorized and tagged Five Nights At Freddys 4, Indie, Scott Cawthon, Steam. Bookmark the permalink.